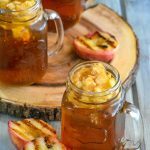 A sweet, yet simple, fruit infused Southern sweet tea this one gets it's refreshing flavor boost from chopped, caramelized grilled fresh peaches. Grill the peaches over medium high heat for 6-8 minutes, until lightly charred and the sugars have released and caramelized. Remove the peaches from the grill, to a clean cutting board. Let the peaches rest, until cool enough to handle. Carefully peel the skins off and discard. Roughly chop the peaches, careful to not let any juice escape. Pour the sweet tea into a pitcher or carafe. Transfer the peaches and any juice to the sweet tea, stirring to combine. Refrigerate until chilled, and up to overnight, before serving. The longer you let the tea sit, the more flavor it will take on. Fill 4-6 halfway with ice, fill with tea. Scoop a spoonful of the tea soaked peaches into each glass, and serve.